Where are the electric cars? Unlike the RAC I am more interested in car clubs which had 161,000 members in the UK by January 2011, up from 112,298 members the year before. That is 161,000 people sharing only 3,055 cars between them, no wonder the motor industry isn’t that keen. Car club members tend to only use cars for the odd journey and are much more likely to walk, cycle and use public transport for everyday journeys reducing congestion and pollution for everyone and also the need to build roads. So, no wonder that the road builders aren’t keen. 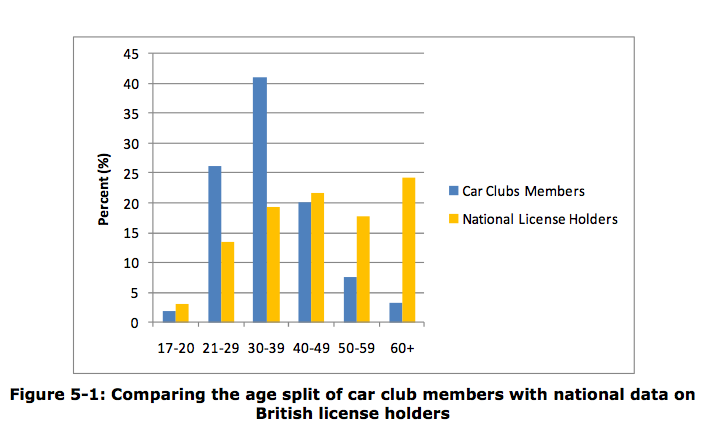 The really interesting thing about car club membership however is the demographic profile. Here is a chart from the Carplus report shows that car club membership is strong amongst younger drivers which is always interesting. I wonder what the demographic profile of people buying electric cars is? So… personally, if I was the new Transport Secretary I would not want to be sitting where Philip Hammond is sitting in the picture below taken in July 2011. I would pushing for money to be spent on supporting car clubs and would be resisting the road building and motoring lobby. If I was the RAC Foundation, or to give them their full title of ‘Royal Automobile Club Foundation for Motoring Limited’ I would be worrying that it was all going horribly wrong. The RAC Foundation has published another doom-laden but impressive report (60 pages this time). This one published last week was promoted with the heading ‘Millions more cars, billions less investment, much greater delay’ and goes on to detail how bad transport in the UK is and that it is going to get worse. They claim that there will be far more cars coming onto the road, that motorists are ‘over taxed’ and that there is not enough investment in roads. Do also check out my post about their last report and road lobbying generally which puts out the same general message. Here is a key graph they reproduce in the document as evidence for their case. The DfT, who produced the figures, clearly believe that the leveling off is a minor disturbance in a graph that will soon start romping upwards again. Others believe that this graph shows a peak and the possible beginnings of a decline – this theory is called ‘peak car‘. So… is this a pause in an upward trend, is it a permanent leveling off or is it about to turn down (peak car)? This is clearly a very important question for planners. Peak car is mentioned briefly on page 20 before being dismissed with the comment “But, significantly, ‘peak car’ does not remove the impact of ten million more people – who between them will drive four million more cars30 – in the UK in little more than two decades’ time. Whichever way you look at it, the result will be: more congestion“. 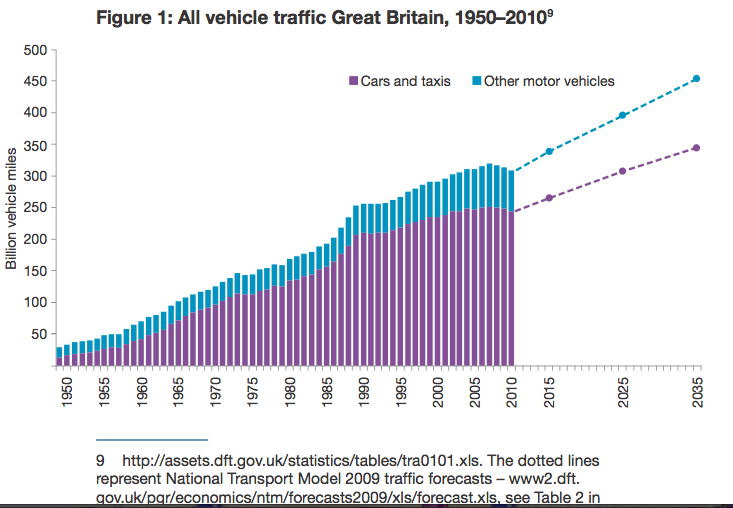 What they are failing to acknowledge is that ‘peak car’ is about decline not leveling off. They mention car clubs briefly (car sharing the North America) before dismissing it with the comment: “the impact on car usage, however, is not yet fully understood. Car sharing, car clubs and car rental are all growth areas and are likely to make their mark, mainly in large urban areas“. Others, including the founders of Zip Car, are delighted with the explosive growth of car clubshaving created a business with a valuation of $1 billion in just 11 years. They also fail the growth of the express coach network and the phenomenal success of Megabus both in the UK and in the USA (a £400 million turnover business created from scratch in under 10 years according to Brian Souter). Greyhound is also doing well in this country and usage of National Express services are also increasing. And of course they certainly do not quote Professor John Urray from Lancaster University who has predicted that “petroleum car system will ﬁnally be seen as a dinosaur (a bit like the Soviet empire, early freestanding PCs or immobile phones). When it is so seen then it will be dispatched for good and no one will comprehend how such a large, wasteful and planet-destroying creature could have ruled the earth. Suddenly, the system of automobility will disappear and become like a dinosaur, housed in museums, and we will wonder what all the fuss was about… changes in existing ﬁrms, industries, practices and economies. Just as the Internet and the mobile phone came from ‘nowhere’, so the tipping point towards the ‘post-car’ will emerge unpredictably“. On a positive note they do talk up ‘pay-as-you-go’ driving, saying “‘Pay As You Go’ is a concept we are all deeply familiar with and find wholly acceptable. Phone charges are based on how much we talk and when we do so. Electricity and gas bills are calculated on the amount of energy consumed and the time of day it is used. Increasingly, water usage is also metered. Even in the transport sphere – on trains and planes, buses and coaches – we are comfortable with, or at least understand, the idea of differential pricing related to when we travel, and where we travel to“. What I don’t understand is why ‘pay-as-you-go’ won’t reduce the amount of driving if it was applied across the board. If the amount is driving is reduced then why would new roads be needed? This is one of saddest maps I have ever studied. 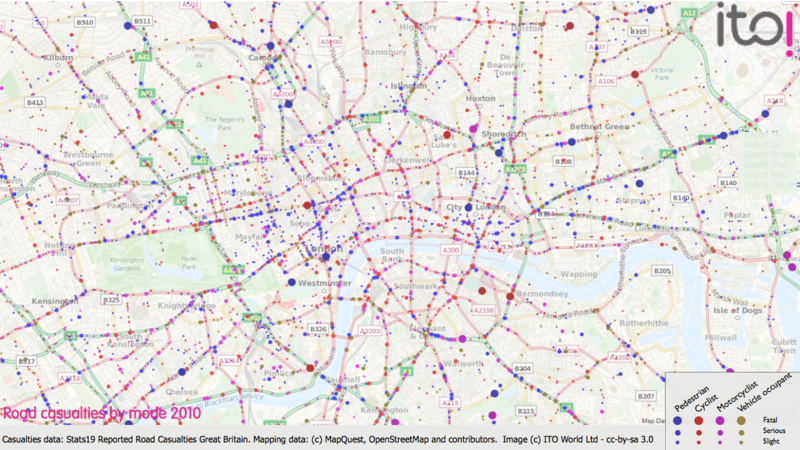 It is an online slippy map showing where people died in traffic collisions – every single square represents someone who didn’t come home one day over the past 10 years. Here are some screen-grabs. 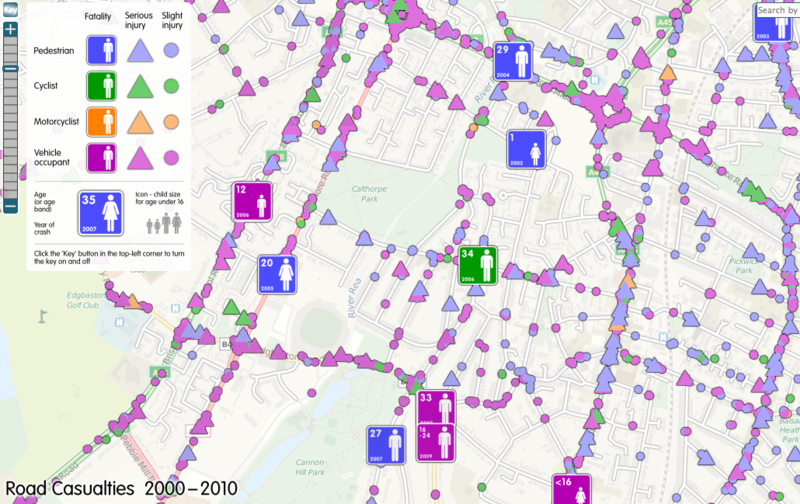 The first image is for the West Midlands area; the blue square indicate where people were killed in traffic crashes while walking, the green ones for people cycling, the orange ones for people on motorbikes and the purple ones for vehicle occupants. The second image gives a more detailed view. Notice the 1 year old girl, the 12 year old boy, the 20 year old young woman and all the others. Do try it for yourself and see what the war likes around where you live. When is this civil war (between motorcars and people) going to be brought to a close and who will ensure that it happens? Possibly for starters we should take a moment to grieve on Sunday along with thousands of other people around the world on World Day of Remembrance for Road Traffic Victims. See below for places where services are being held in memory in the UK. Casualties: Stats19 as deposited by the DfT. © Crown Copyright. In a piece on BBC news today various motorists were saying how fuel prices were ‘ridiculous’ and that the government should ‘do something’. 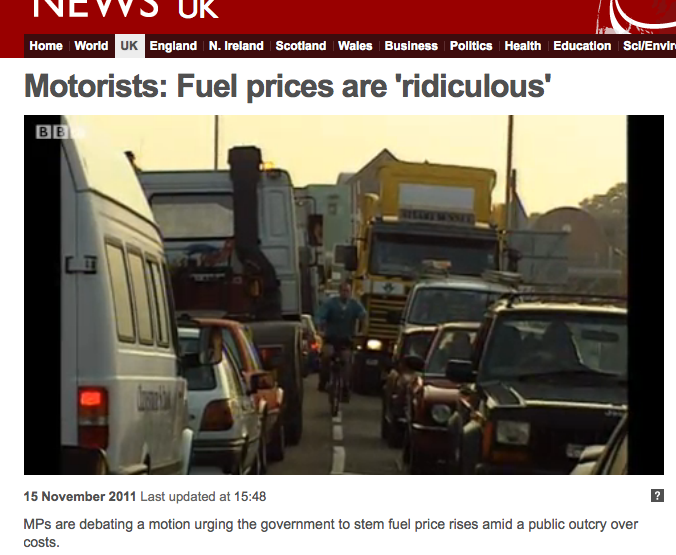 After all, this is all the government’s fault and no one could have predicted that fuel prices were going to increase. Here are a couple of images from the piece. Forgive me if I am wrong, but is the first car not just a tad larger and more fuel-hungry than the driver needs it to be? Is it also not a very dangerous car? And can’t I just about make out a cyclist fighting his way through a line of stationary vehicles? A ridiculously busy cycle path? What is disappointing is the choice of imagery that the BBC chose to feature without any critical comments or rebuttal form any non-motoring angle. Why didn’t they interview anyone who had adjusted their lives to avoid this totally predictable situation? Why did they not interview anyone who is building a business and benefiting from the shifts that are coming with changes as fuel prices rise? Why didn’t they interview the cyclist? Of course this is not the first time the BBC has pretended that pedestrians did not exist. I wrote a blog post some time back about a BBC article on ‘ending road fatalities’ that failed to mention pedestrians once! I have be reminded by a comment below that the BBC also do some great news stories about cycling such as this one on Look East (starting at 20 minutes). 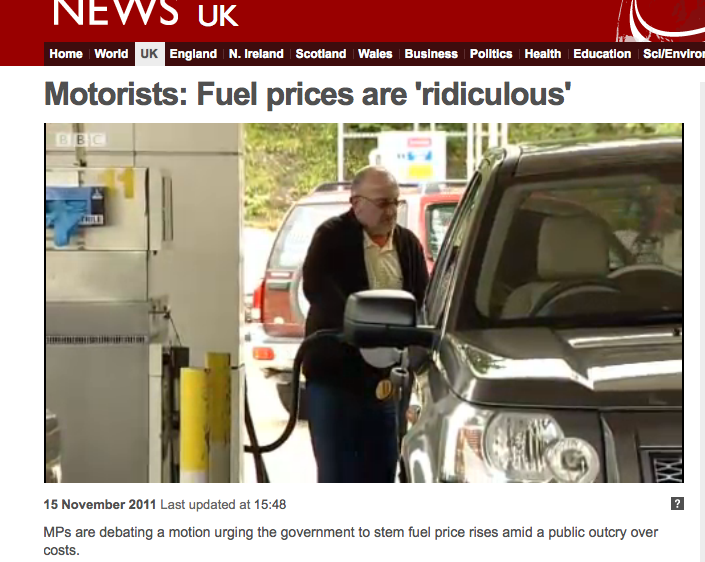 Apologies to the BBC, but I was just so offended by the image of the first car that I was prompted to write this post. 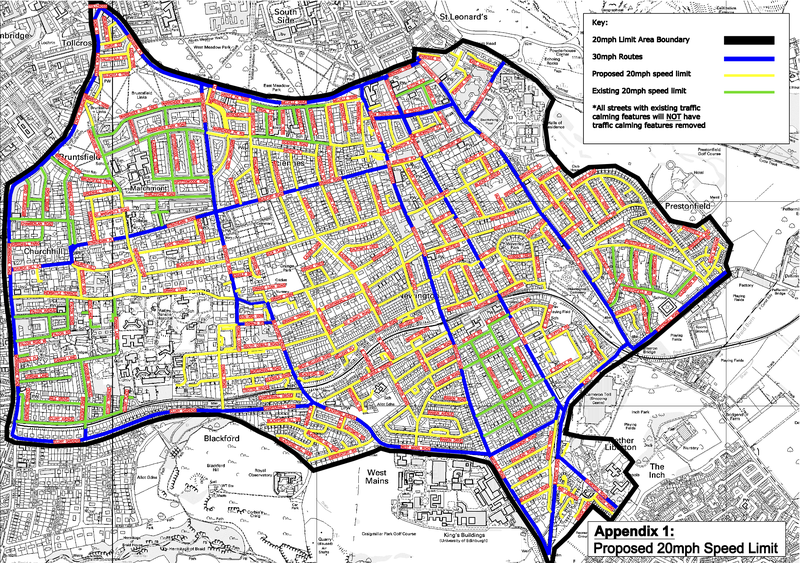 Edinburgh is proposing a significant increase in the number of streets covered by 20mph. This is being promoted as a way to encourage waking and cycling and to improve road safety. It has been reported that they also support the scheme because ‘lower speeds make people feel safer when they are walking and cycling and make streets better places to live’. I am very supportive of 20mph zones, I live in one myself, and they do indeed help make streets feel less intimidating. However.. it is also very clear that 30 mph speed limits are being retained on the roads where most people are getting injured. One realistic approach for now might be to welcome the introduction of these 20 mph limits in residential areas and also to also press for average speed camera checks on the remaining arterial roads enforcing the 30 mph limit as they have just installed in part of Plymouth. The Stats19 casualty data that the police have been patiently collecting for many years now is a mine of information. 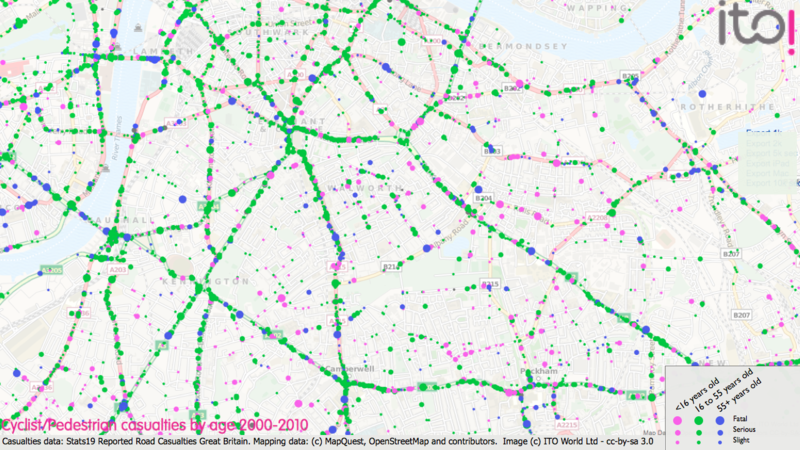 Here are some maps looking at where pedestrians and cyclists are injured and killed depending on their ages. I have taken three places which show up some patterns which deserve more analysis (London, Edinburgh and Northampton). 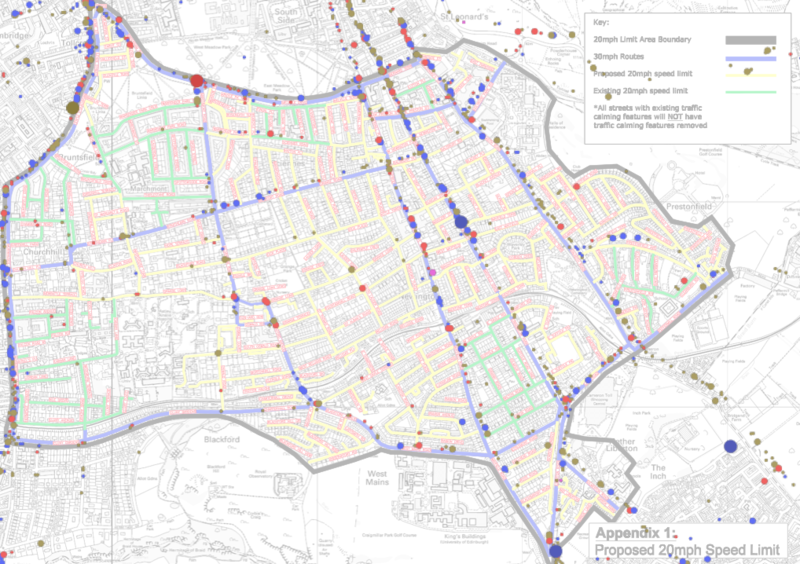 There are some obvious patterns, in that children are hurt in the residential areas, 16-55 year olds tend to be injured in the commercial centres and along the main arterial roads whereas 55+ year olds have their own distinct patterns. However, it is also possible to see tell-tail clusters which deserve more investigation, including the apparent rat-runs along ‘residential’ roads that have much higher levels of injury than surrounding roads, and also the junctions and sections roads where higher numbers of casualties that surrounding ones. Click on the maps to make them bigger and see what you can find. 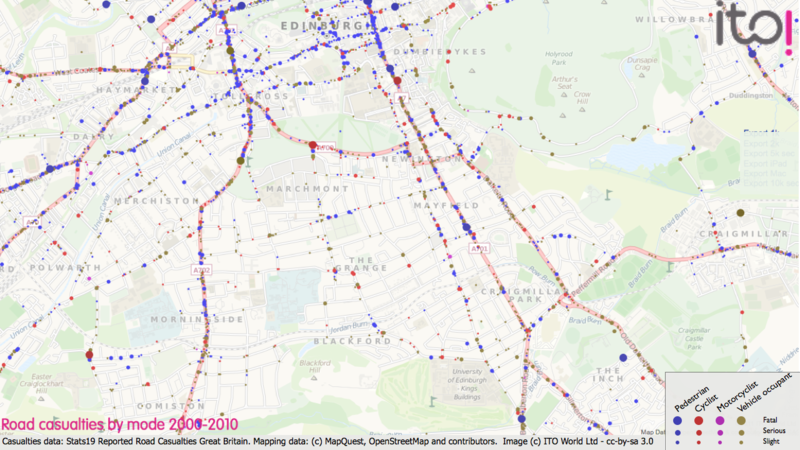 Lots more mapping coming up on the lead up to World Remembrance Day for Road Traffic Victims on the 20th Nov. Thank you to the hundreds of cyclists who took part in the Tour du danger today to highlight a number of London’s most dangerous junctions and put pressure on the Mayor and on TfL to do some serious work on them. Here are some maps showing where people are have been getting killed and injured in recent years. 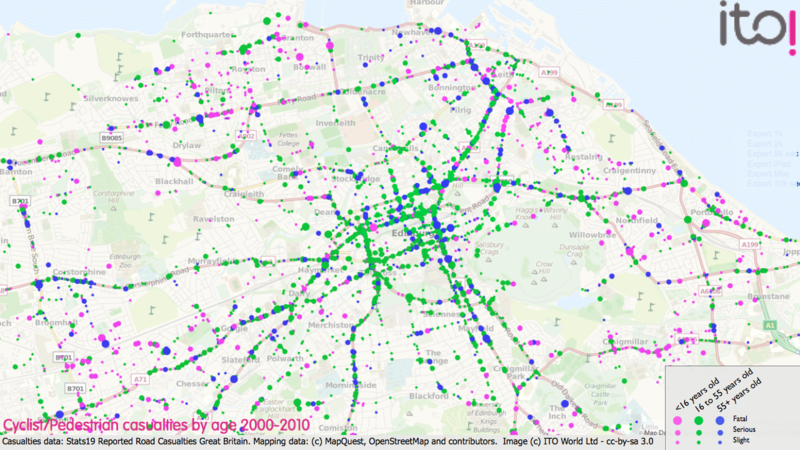 The first one shows deaths and injuries from traffic crashes between 2000 and 2010, the second for 2010 only and the next one for 2009 and the final one for 2000. 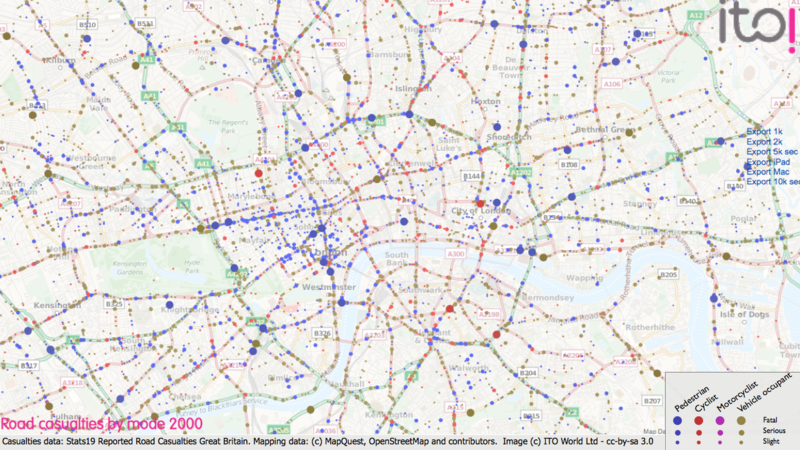 Areas of blue indicate were pedestrians are getting injured and killed, red shows the high risk areas for cyclists. Purple is for motorcyclists and tan/green for vehicle occupants. Click on the images to see them full size. 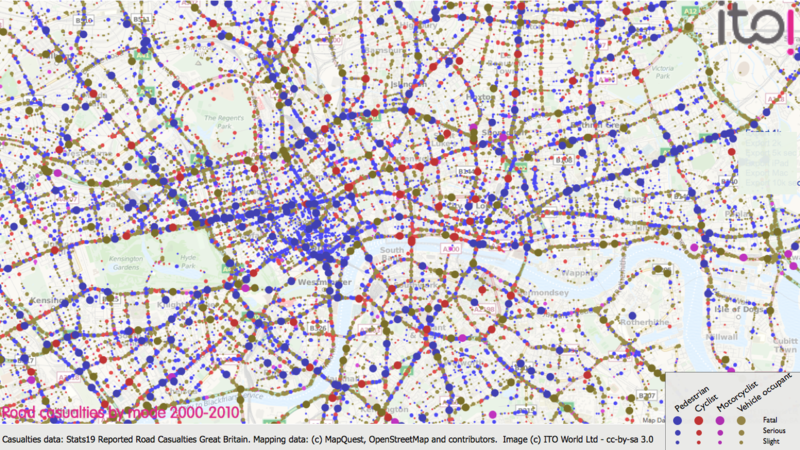 These maps appear to show that fatalities amongst vehicle occupants has fallen from 17 in 2000 to one in 2009 and then zero in 2010. For cyclists the trend is apparently going the other way (up from four in 2000 to eight in 2009 and also in 2010). Motorcyclist fatalities are up from 0 in 2000 to 6 in 2010, pedestrians falling significantly. Do however be aware that this map only shows one fatality blob for crashes with multiple fatalities (which may include multiple modes). I will do some more work on this in the coming week and the figures may then need to be adjusted upwards. Based on Stats19 road casualty data. 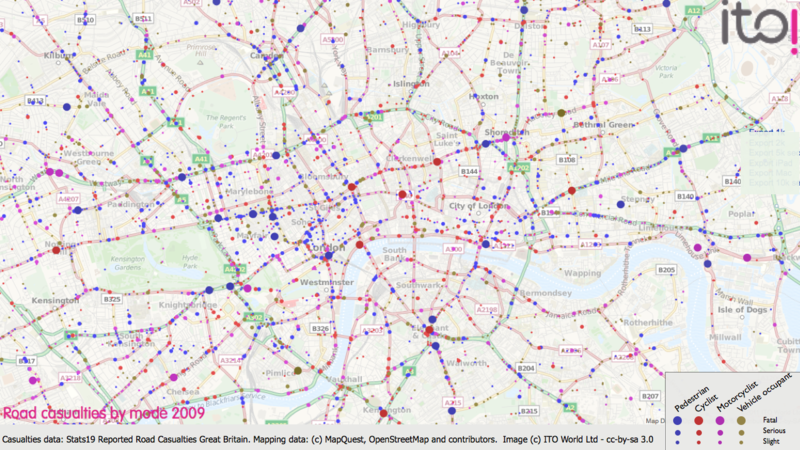 See ‘Reported Road Casualties Great Britain‘ for more details.